In 1574 Elizabeth I gave Robert Dudley, Earl of Leicester, some land in Hemel Hempstead which had previously been associated with the monastery at Ashridge. This was sold and in 1581 the water meadows known as Box Moor were secretly purchased on behalf of the inhabitants of Hemel Hempstead and Bovingdon. In 1594 these lands were conveyed to sixty-seven Feoffes (trustees), to be held in trust for ever. The trust still exists and now consists of nearly 500 acres of land which play an important part in the life of the neighbourhood. This is a major work which describes not only the history of Box Moor, but also its past and present role in the local community and the environmental role it now plays in fostering wild life. 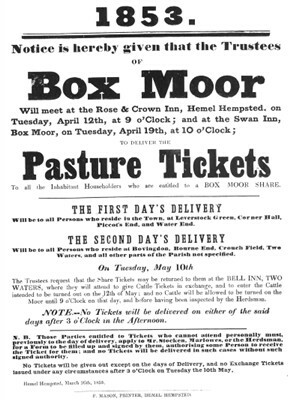 For instance Part IV includes sections on the Boxmoor Baths (the swimming pool by the canal), cricket (an area was levelled for a cricket pitch as early as 1836, and games are still regularly played on the Moor), golf (the Boxmoor course opened in 1890), rugby and football, all well illustrated with pictures. My conclusion is that the book is a very interesting and attractive account of an unusually successful 400 year old trust, which has played an important part in the history of both Hemel Hempstead and Bovingdon, and also in the development of transport routes through the Chilterns in West Hertfordshire. If your ancestors came from the area (or you live there) this book is well worth getting. The index for the body of the book contains plenty of names - which will please the genealogist - although care should be taken as the lists in the appendix are not indexed. The book also shares a fault with perhaps 90% of similar works - in that the sources used are often not identified. This means that if you find a mention of your ancestor you may have difficulty in going back to the primary sources to verify and expand the information. An example of a minor problem about sourcing is that the book mentions the "Wicked Lady of Markyate" as if the story were true rather than a 19th century composite legend, much repeated and expanded in the 20th century (see The Wicked Lady of Markyate Cell). However such details should not put you off purchasing this excellent book. 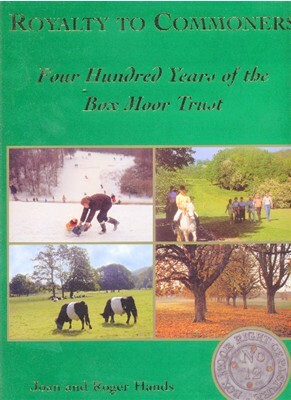 See the boxmoortrust.org.uk web site for more about the Trust and details of the book.